For ye rising of ye mother Take Columbine seed and Parsnip seed. of Each 3 Spoonfuls. 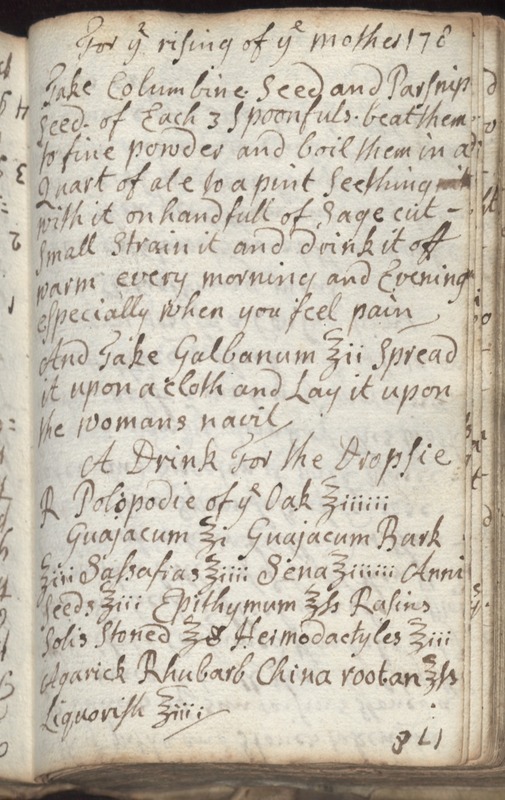 beat them to fine powder and boil them in a Quart of ale to a pint seething with it on handfull of Sage cut - Small Strain it and drink it off warm every morning and Evening especially when you fell pain. And Take Galbanum Zii spread it upon a cloth and Lay it upon the womans navil. A Drink For the Dropsie R Polopodie of ye Oak Ziiiiii Guajacum Zi Guajacum Bark Ziii Sassafras Ziiii Sena Ziiiiii Anni Seeds Ziii Epithymum ZSs Rasins Solis Stoned Zs Hermodactyles Ziii Agarick Rhubarb China root. an ZSs Liquorish Ziii i.